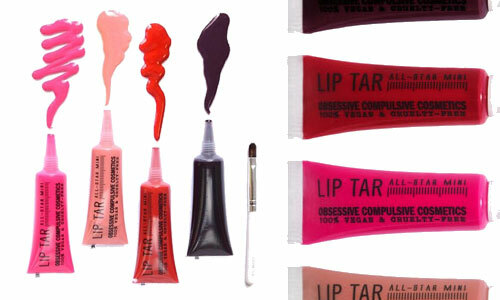 Don’t be fooled by the small size of the tubes - MINI LIP TAR pigments are powerful. These lip tars are somewhat of a combination of a lip stick, lip gloss, and a lip stain - lip stick because of the complete full coverage color; lip gloss because of the glossy finish; lip stain because once you apply the color it sticks around until you decide to take it off. Just try them once and you will quickly understand their amazing tri-lip-product powers. However, for best usage, I recommend 3 things. A brush is included in the Sephora Holiday Exclusive Gift Set shown above, making it an excellent stocking stuffer. These small tars might have inspired Ann and myself to look incredibly bold today … maybe you saw if you follow us on Instagram!